Part of the Cygnus Loop, the Eastern Veil Nebula is one of the brighter sections of the loop and is visible in telescopes, especially with the aid of contrast enhancing filters. Image acquisition: Taken with an AP130EDTGT and modified Canon T5i camera. 60 exposures of 2 minutes at ISO 1600 unguided were combined and processed in Pixinsight with final enhancement in PS CS. Taken during Greenbank Star Quest 2018. 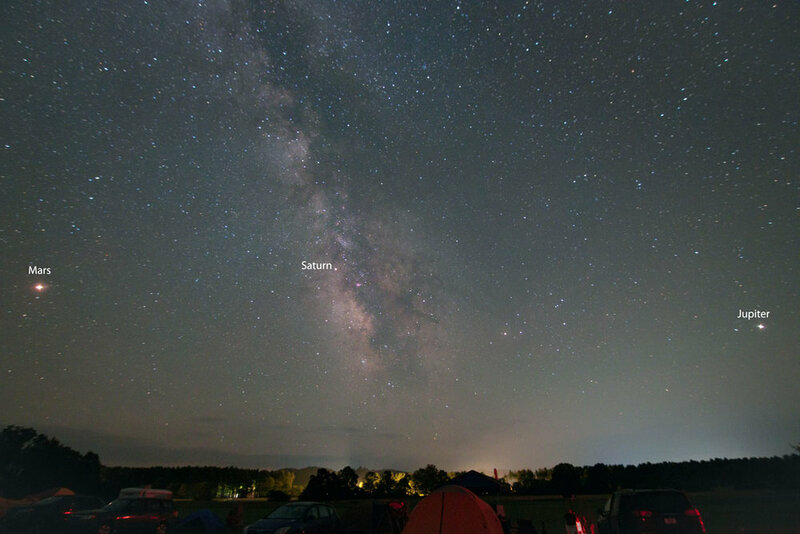 In the early morning hours of July 14, the astronomers at the Green Bank Star Quest, who were still awake, had a great view of three planets distributed across the sky in nearly equal segments with the Milky Way blazing vertically toward the zenith. A great non-telescopic vision to be sure. I hope you can get out under a dark sky this summer to enjoy the beautiful heavens. Image acquisition is with a modified Canon T1i and Tokina 11-16mm zoom at 11mm and f2.8 for 30 seconds on a tripod. How convenient, my company decided to hold a meeting in Newark, NJ the week prior to NEAF. This provided a great opportunity for me to attend the highly acclaimed event for the first time. Rockland Community College, site of NEAF, is located 40 miles north of the Newark airport. The gymnasium facility is very appropriate for the event with ample space for vendors and an appropriately sized auditorium for the presentations. I realized on Saturday morning that I had made the transition to a pure astrophotographer when I had no desire to stand in the Televue line for deals on eyepieces and other viewing equipment. Al Nagler is always a great participant in this event. 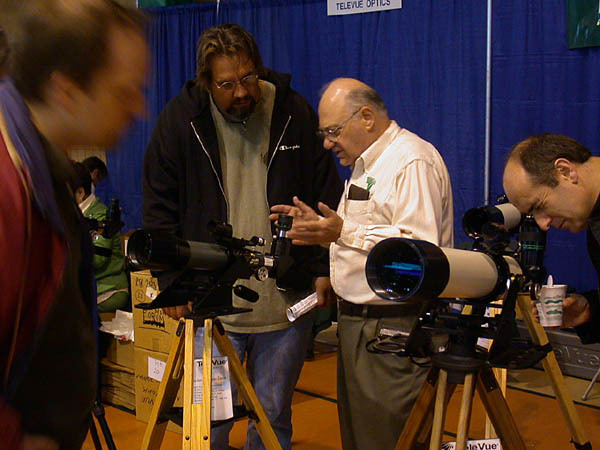 He enthusiastically shared his telescope and astronomy knowledge with many attendees. Dr. Rob Gendler lectured and presented his astronomical images. I must say, I have long admired the web presentations of Dr. Gendler's images, but seeing those huge prints up close was even more impressive. The images were smooth and had great dynamic range. The presentation was very comprehensive regarding all aspects of CCD astronomy. His lecture was one of the most well received during the entire conference. My short time to interact with Rob was very enjoyable and educational. It was obvious that Rob has a tremendous passion for imaging and his commitment to excellence is second to none. Vixen telescopes. Vixen was on display with Highpoint Scientific. According to Bill Copeland, Vixen sales manager, the company is now a division of Tele Vue Optics. The Vixen telescope catalogue got me very excited. Great offerings for the astro-photographer like their medium format capable DED 108SS doublet ED refractor with 540mm focal length at f5. 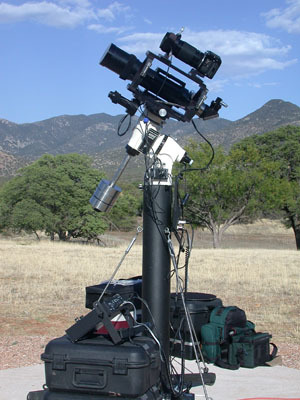 Many other great telescopes and astrophotography accessories. The Televue/Vixen relationship will prove to be very interesting to watch as time goes by. 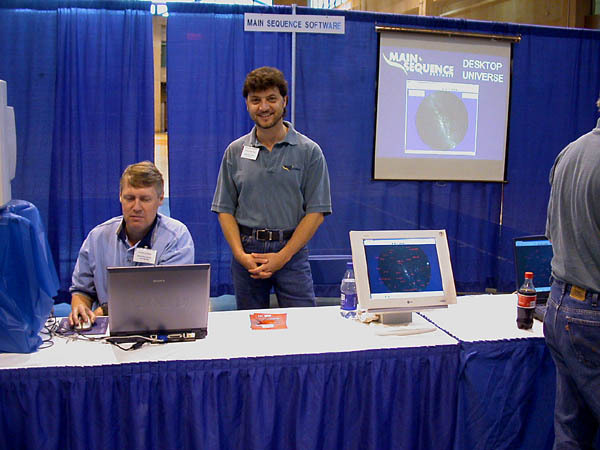 Software: There were two very interesting software offerings presented. For lunar observers, this may become the equivalent of planetarium programs like The Sky or Megastar. 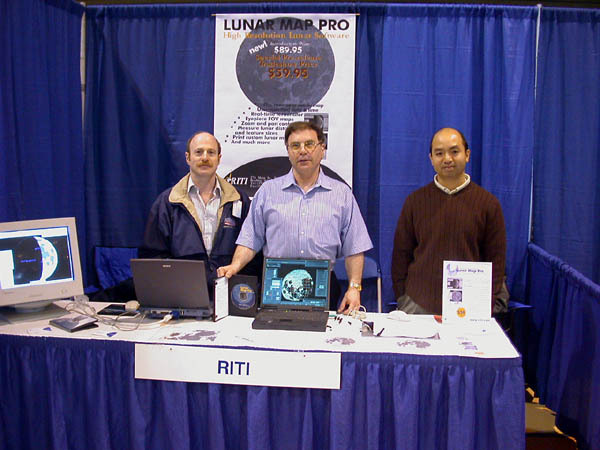 Observers will be able to print custom lunar maps, flip, reverse, or rotate the map to match the view through any telescope, measure lunar distances, and more. 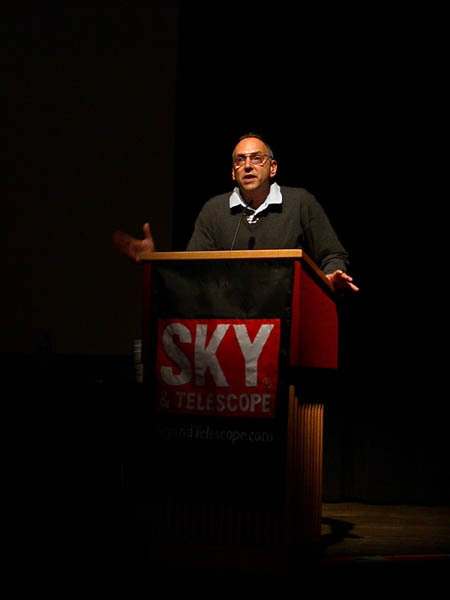 David Levy: Tails and Trails: A lifetime of observing the night sky. 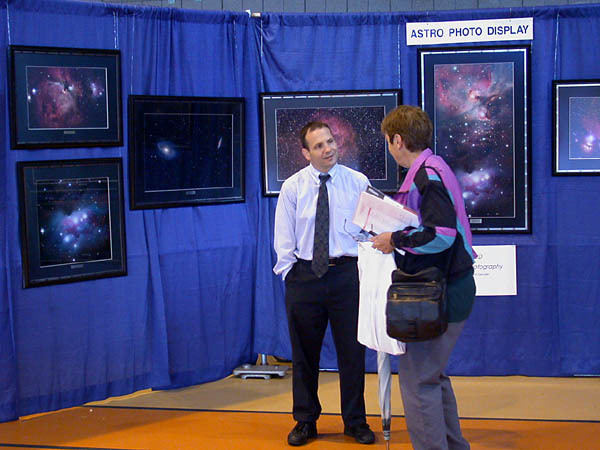 Can you remember what event first sparked an interest within you for astronomy? Mr. Levy recalled the days of his youth in a summer camp where his first glimpse of a meteor sparked his interest in astronomy. That passion has not waned to this day. It was ironic in a way to listen to Mr. Levy. It was his comet, Shoemaker/Levy 9, that rekindled my interest in astronomy, now over 8 years ago. David's passion for the simple beauty of the night sky is contagious. I find myself cluttering my original wonder of the night sky with concerns over mechanical or equipment functionality. Mr. Levy has helped me to regain the original wonder I discovered on my first nights out with the stars...I will never let that wonder become a faded memory again. There were many other great products and presentations. The solar presentation by Dr. Mary Lou West was outstanding, as well as Dr. John Grunsfeld's (NASA astronaut) presentation on the Hubble Telescope upgrade. NEAF is a world class event. If you have an opportunity to check it out, I heartily recommend you do. Clear skies, Jeff. Nestled in the foothills of the Chiricahua mountains, Sunglow Ranch is a great retreat for astrophotographers. The cloudy weather pattern at New Mexico skies looked relentless. The satellite images showed a swirl of cloud formation reaching northwestward from Mexico and Texas into the Sacramento mountains. The cloud pattern never seemed to reach into Arizona. 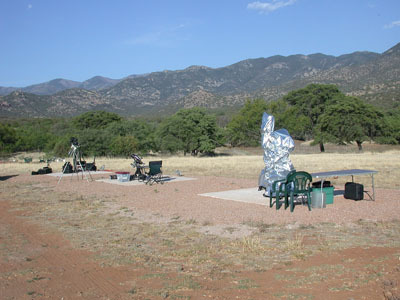 There was a wall of clear skies to the west that seemed to be an opportunity for eager astro-imagers On the 3rd day of monitoring this activity, Ernie and I decided to make the move: we were relocating to Sunglow Ranch in southeast Arizona. We made a quick phone call to Sunglow to confirm that rooms were available. After a couple of hours packing gear, we were off on the 6 hour trek across the desert southwest. This was my first driving experience in this region. All of my westward trips have been via airlines. Yes, you can see forever. Mountains on the horizon seemed to take forever to reach at interstate speeds. Pecan tree farms, wineries and dust devils would occasionally break the monotony of the brown and rocky landscape. Ernie and I were skeptical that we would reach the break in the clouds as we continued westward. Upon reaching Wilcox, AZ, we knew we had made the right decision to relocate. The clouds were well to the east and the skies overhead were dry and clear. Arriving at Sunglow, there was a quiet relaxing atmosphere that soothed any anxieties we had about the place. Three concrete pads welcome the astronomer. The pads are nicely sized to accommodate at least one photographic setup if not two. The pads are about 100 yards from the guest rooms. The landscape lights around the campus are extinguished at the end of twilight. The skies are very nice. A subtle light dome is present to the south-southwest and rises just above the mountain ridge. This may impact some exposures of far southern objects once they have passed the meridian. The Chiricahua mountains provide a beautiful backdrop for star trail photography. Other activities include hiking and birding. Sunglow is really a retreat from it all. Don't expect to communicate with the outside world without a fair amount of effort. This truly was a relaxing and enjoyable environment for astrophotography. This was the first night of imaging on the trip and was actually the first night I had imaged with this setup. I mounted my AP Traveler on a side-by-side plate with a Pentax 300mm lens and the STV Efinder riding on the low end of the 130 rings and plates. Unfortunately, this setup proved to be a little too much for the 600 mount. The work with the Traveler was not up to specs. The 300mm lens work was fine. I did shoot with Provia 400 on the 300mm and really did not like the results. This was unusual as I had previously like the Provia results. At least on this trip, I preferred the E200 color balance and overall presentation vs. the 400 Provia and thus made the switch to all E200. Ernie Mastoianni was my buddy. Ernie has extensive photographic experience as a journalist for the Milwaukee Journal Sentinel. Ernie's setup included a G11 on a home built base with a Nikon 800mm f5.6 lens and ETX guide scope with assorted Hasselblad cameras and lenses riding piggyback. This brings us to the topic of ambiance. Yes, I can't believe we are talking ambiance on an astrophotography trip, but it was certainly there at Sunglow. Breakfast and dinner are included in the overnight package price. I am not talking breakfast buffet at Hampton Inn. The breakfast and dinner was exquisite dining complete with fine wine at dinner. For me, this is the way an astrophotography trip should be; no worries in the world with the exception of taking good astrophotographs. The Sunglow staff numbers only a handful, but the hospitality is abundant. In just a few hours, everyone on campus will be greeting you by name. We just couldn't help but laugh when we thought of the ambiance we left behind at NMS with nine guys in a house. You know the ambiance that nine guys can create, right? Here we are with fine dining and great company. George and Saul also hooked up with us from NMS. They were enjoying visual astronomy and had been at Andy Homemeyer's place in New Mexico for a visit when they decided to meet up with Ernie and me at Sunglow. We also had the pleasure of meeting Jennifer from California. She was on a personal retreat and took in the hiking opportunities in the Chiricahua area. The fellowship among these friends was delightful. A truly enjoyable experience. One I will not forget. 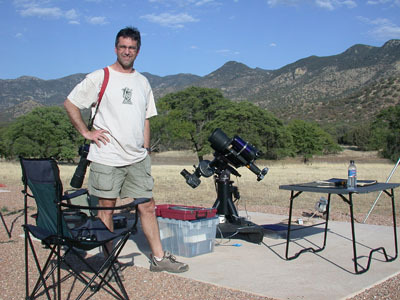 Sunglow Ranch is a truly enjoyable astronomical location. I am scheming on how to return to this astronomical retreat as soon as possible, and I may even bring my wife for our second honeymoon!